Every child is an artist; the problem is staying an artist when you grown up. Ever since she was old enough to hold a crayon, Natalie has created. She scattered her art joyously, indiscriminately. My fridge was a gallery, the edge of my computer screen held drawings on sticky notes, her paintings hung on my office wall. It wasn't unusual for me to wake up and find a tiny sketch next to my alarm clock, or for Corey to find one in his travel bag. 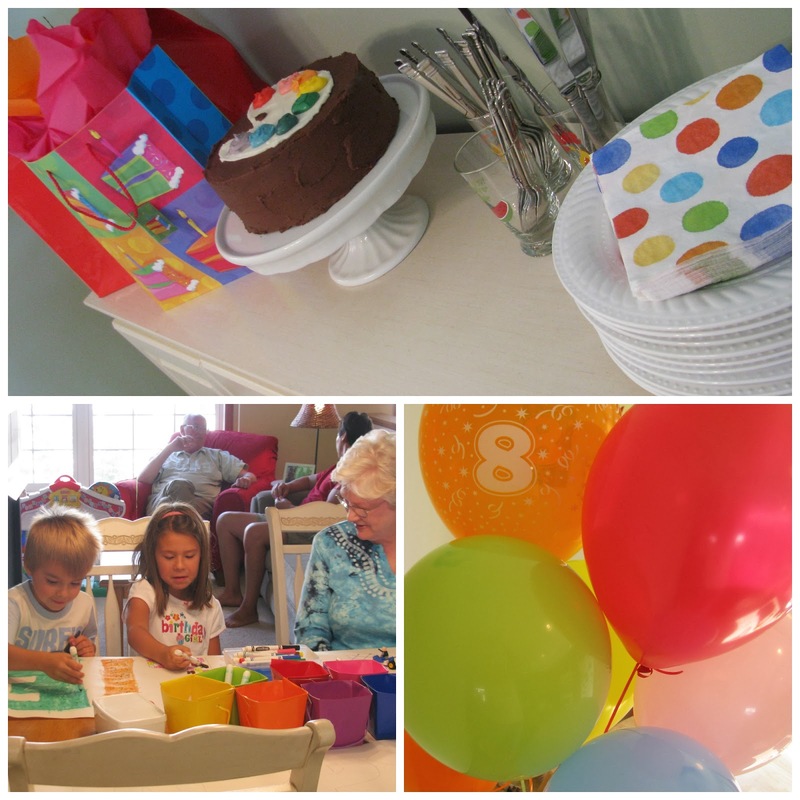 So when Natalie turned 8, we threw an art party, to celebrate one of the great loves of our oldest child. 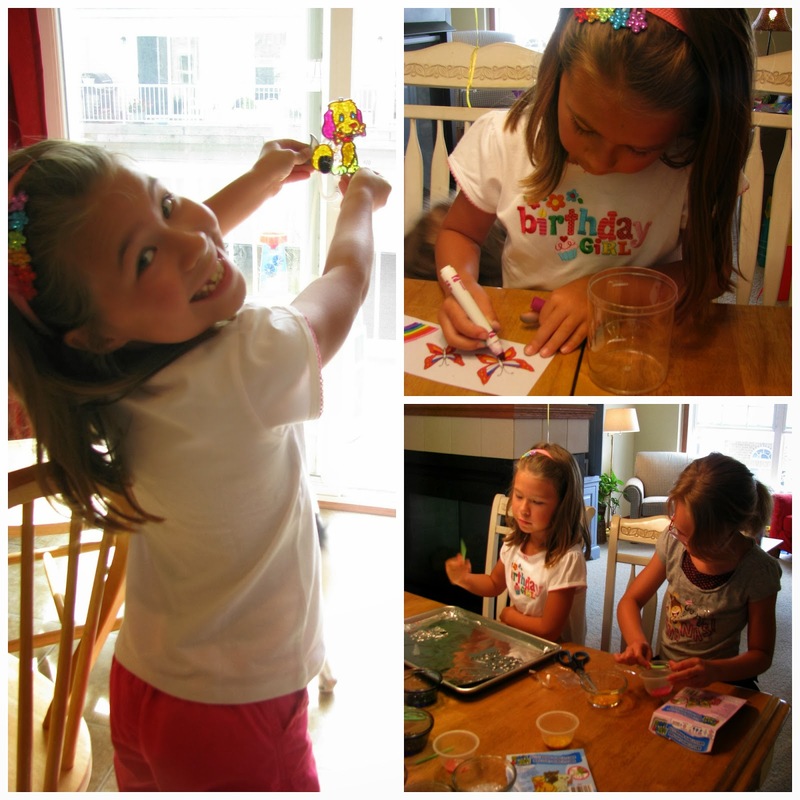 The fun centered around crafts and art, naturally. Best of all: the guests took every home everything they created. (Easiest goody bag ever for the win!) Projects included customizable drinking mugs (remember those?) and sun catchers, which I finished in the oven while they were eating cake. Speaking of cake: Here's a two-fer. 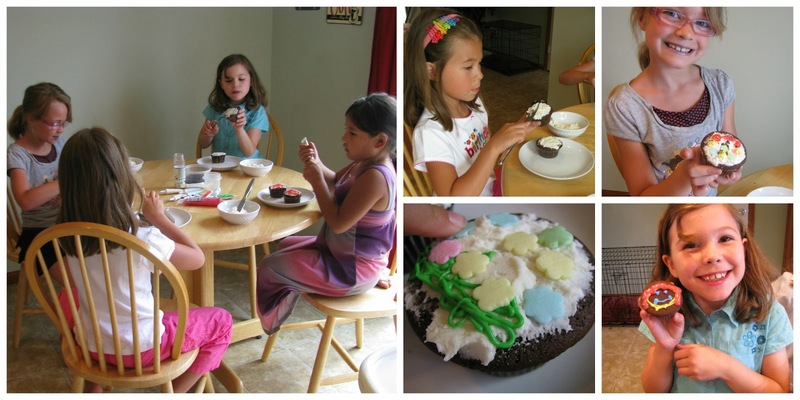 The most popular craft was a cupcake decorating station. The girls each got 5 cupcakes to decorate as they wished. They ate one at the party and took the rest home in a cupcake box. And that is how I got Natalie and her guests to do my work for me. But you know I couldn't leave it that way for her family party, right? I love to bake, and coming up with an easy design to fit the theme of my kids' birthdays is half the fun for me. Per usual, I began with the best chocolate cake ever, Natalie's favorite. 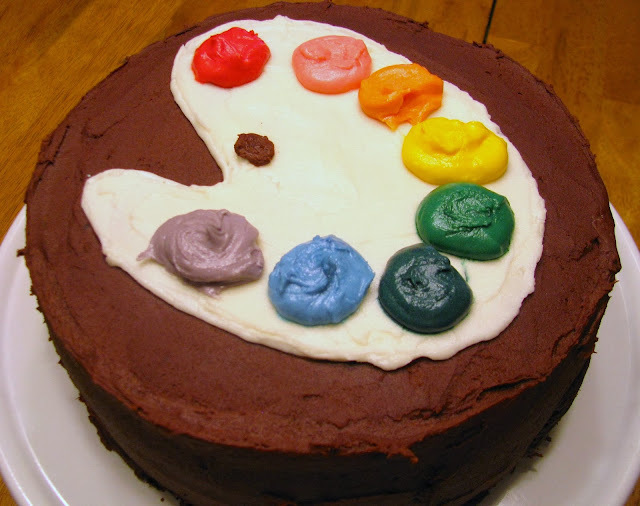 Because this was an art party, I piped a paint palette on the top using white frosting and filled in my outline. 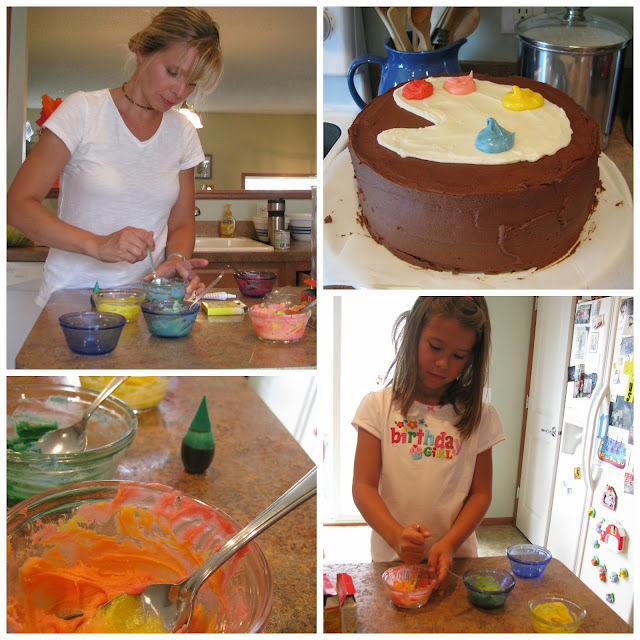 Then - the best part - Natalie and I portioned out the rest of the white frosting into small bowls and tinted each bowl a different color. Those were my paint globs on top of the palette, resulting in easily one of the cutest cakes I ever made. We used a rainbow of colors for decor, as fitting an artist. 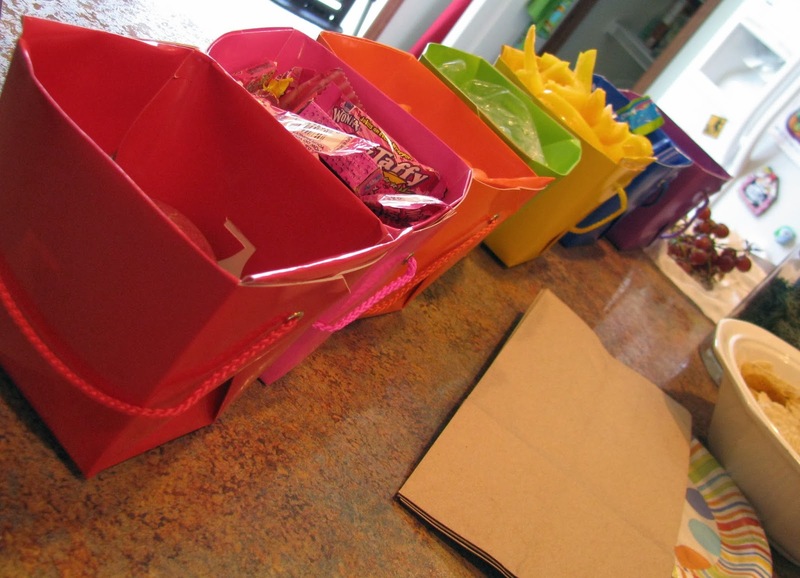 Finger foods were set out in bright take-out boxes. 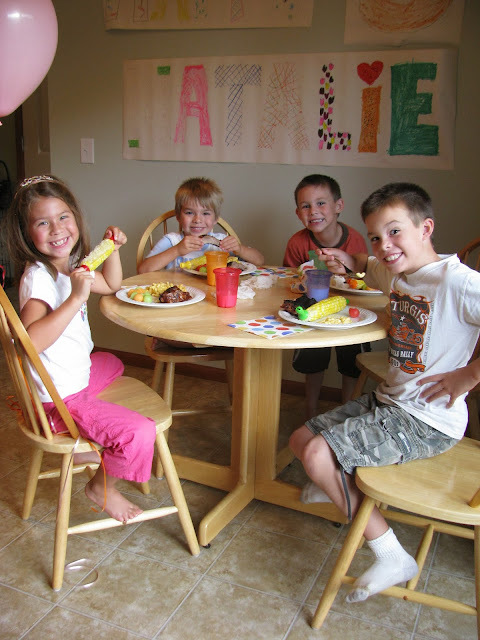 The buffet for her family party was decked out in bright dots and balloons. And because we wanted even the family party to center around art, we set out large sheets of craft paper before dinner and encouraged everyone to create a banner for Natalie's birthday. We kept it hanging on the wall for weeks because art with a great memory attached to it is the best art of all.